Enabling you to safeguard your identity and significantly limit the threat of fraud, shredders have become an invaluable addition to most homes. Even if you only use it to shred letters and other documents that feature your name, address, phone number or bank details, a shredder can offer protection and help you deal with clutter quickly and easily. If you’re on the lookout for a shredder, your first priority should be reliability. After all, their purpose is to give you peace of mind by providing an efficient way to keep your details safe. Rexel shredders are renowned for their dependability, whether you’re after a modest entry-level model or a serious, high-security shredder that will take large volumes of paper in its stride. The Style Cross Cut Paper Shredder is a compact, affordable Rexel shredder that nonetheless delivers impressive performance. Constructed with high performance steel cutters for efficiency and durability, it even deals effortlessly with credit cards, staples, and paper clips. 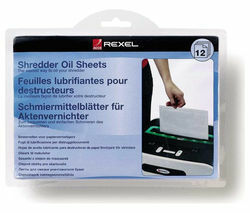 We stock a number of Rexel shredders that are designed to tackle large volumes in no time at all. The professional standard Auto+ 300X Cross Cut Rexel shredder will shred up to 300 sheets of paper at once, effortlessly tackling credit cards, paper clips, and staples, and CDs. If you need a shredder that will take care of large volumes of paper in an instant look no further. To view our complete collection of cross cut shredders, including the latest models from Fellowes, see our office supplies department, where you’ll find all your office essentials, from laminators to labelling machines.